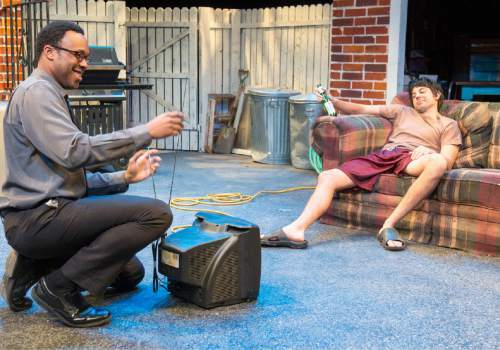 Review • SLAC's debut of "Streetlight Woodpecker" features unforgettable characters created by Stefan Espinosa and Carleton Bluford. Rick Egan | The Salt Lake Tribune Stefan Espinosa (left) Carleton Bluford Center, and Olivia Custodio (right) rehearse in Salt Rick Egan | The Salt Lake Tribune Carleton Bluford (left) and Stefan Espinosa (right) rehearse in Salt Lake Acting Company's & Rick Egan | The Salt Lake Tribune Carleton Bluford (left) and Stefan Espinosa (right) rehearse in Salt Lake Acting Company's & Rick Egan | The Salt Lake Tribune Carleton Bluford (left) and Stefan Espinosa rehearse in Salt Lake Acting Company's "Str Rick Egan | The Salt Lake Tribune Carleton Bluford (left) and Stefan Espinosa rehearse in Salt Lake Acting Company's "Str Rick Egan | The Salt Lake Tribune Stefan Espinosa (left) and Carleton Bluford rehearse in Salt Lake Acting Company's "Str Rick Egan | The Salt Lake Tribune Stefan Espinosa (left) and Carleton Bluford rehearse in Salt Lake Acting Company's "Str Rick Egan | The Salt Lake Tribune Stefan Espinosa (left) and Carleton Bluford rehearse in Salt Lake Acting Company's "Str Rick Egan | The Salt Lake Tribune Stefan Espinosa (left) and Carleton Bluford (right) rehearse in Salt Lake Acting Company's & Rick Egan | The Salt Lake Tribune Carleton Bluford and Stefan Espinosa rehearse in Salt Lake Acting Company's "Streetligh Rick Egan | The Salt Lake Tribune Stefan Espinosa (left) and Carleton Bluford rehearse in Salt Lake Acting Company's "Str Rick Egan | The Salt Lake Tribune Mathew Sincell and Stefan Espinosa rehearse in Salt Lake Acting Company's "Streetlight Rick Egan | The Salt Lake Tribune Mathew Sincell and Stefan Espinosa rehearse in Salt Lake Acting Company's "Streetlight Rick Egan | The Salt Lake Tribune Mathew Sincell and Stefan Espinosa rehearse in Salt Lake Acting Company's "Streetlight Rick Egan | The Salt Lake Tribune Stefan Espinosa rehearses in Salt Lake Acting Company's "Streetlight Woodpecker,"
Rick Egan | The Salt Lake Tribune Stefan Espinosa (left) Carleton Bluford Center, and Olivia Custodio (right) rehearse in Salt Lake Acting Company's "Streetlight Woodpecker," a new play by Logan playwright Shawn Fisher. Rick Egan | The Salt Lake Tribune Carleton Bluford (left) and Stefan Espinosa (right) rehearse in Salt Lake Acting Company's "Streetlight Woodpecker," a new play by Logan playwright Shawn Fisher. Rick Egan | The Salt Lake Tribune Carleton Bluford (left) and Stefan Espinosa (right) rehearse in Salt Lake Acting Company's "Streetlight Woodpecker," a new play by Logan playwright Shawn Fisher. Rick Egan | The Salt Lake Tribune Carleton Bluford (left) and Stefan Espinosa rehearse in Salt Lake Acting Company's "Streetlight Woodpecker," a new play by Logan playwright Shawn Fisher. Rick Egan | The Salt Lake Tribune Carleton Bluford (left) and Stefan Espinosa rehearse in Salt Lake Acting Company's "Streetlight Woodpecker," a new play by Logan playwright Shawn Fisher. Rick Egan | The Salt Lake Tribune Stefan Espinosa (left) and Carleton Bluford rehearse in Salt Lake Acting Company's "Streetlight Woodpecker," a new play by Logan playwright Shawn Fisher. Rick Egan | The Salt Lake Tribune Stefan Espinosa (left) and Carleton Bluford rehearse in Salt Lake Acting Company's "Streetlight Woodpecker," a new play by Logan playwright Shawn Fisher. Rick Egan | The Salt Lake Tribune Stefan Espinosa (left) and Carleton Bluford rehearse in Salt Lake Acting Company's "Streetlight Woodpecker," a new play by Logan playwright Shawn Fisher. Rick Egan | The Salt Lake Tribune Stefan Espinosa (left) and Carleton Bluford (right) rehearse in Salt Lake Acting Company's "Streetlight Woodpecker," a new play by Logan playwright Shawn Fisher. Rick Egan | The Salt Lake Tribune Carleton Bluford and Stefan Espinosa rehearse in Salt Lake Acting Company's "Streetlight Woodpecker," a new play by Logan playwright Shawn Fisher. Rick Egan | The Salt Lake Tribune Stefan Espinosa (left) and Carleton Bluford rehearse in Salt Lake Acting Company's "Streetlight Woodpecker," a new play by Logan playwright Shawn Fisher. Rick Egan | The Salt Lake Tribune Mathew Sincell and Stefan Espinosa rehearse in Salt Lake Acting Company's "Streetlight Woodpecker," a new play by Logan playwright Shawn Fisher. Rick Egan | The Salt Lake Tribune Mathew Sincell and Stefan Espinosa rehearse in Salt Lake Acting Company's "Streetlight Woodpecker," a new play by Logan playwright Shawn Fisher. Rick Egan | The Salt Lake Tribune Mathew Sincell and Stefan Espinosa rehearse in Salt Lake Acting Company's "Streetlight Woodpecker," a new play by Logan playwright Shawn Fisher. 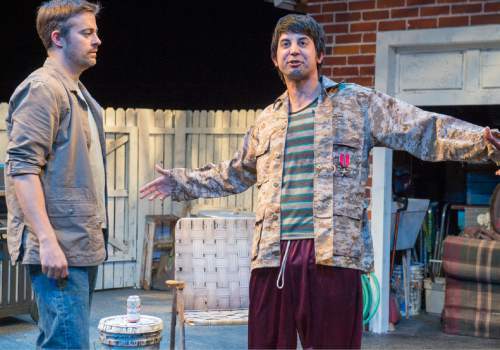 Rick Egan | The Salt Lake Tribune Stefan Espinosa rehearses in Salt Lake Acting Company's "Streetlight Woodpecker," a new play by Logan playwright Shawn Fisher. There is a moment in the second act of "Streetlight Woodpecker," Shawn Fisher&apos;s powerful portrait of brokenness making its world premiere at Salt Lake Acting Company, when everything clicks into place. 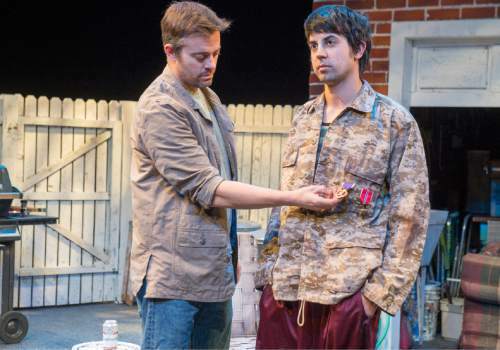 It is one of those "aha" flashes that only happen in well-written plays, and it occurs when Benji tells his best friend, Sam, how he earned his bronze star for "valor in combat" in Iraq. 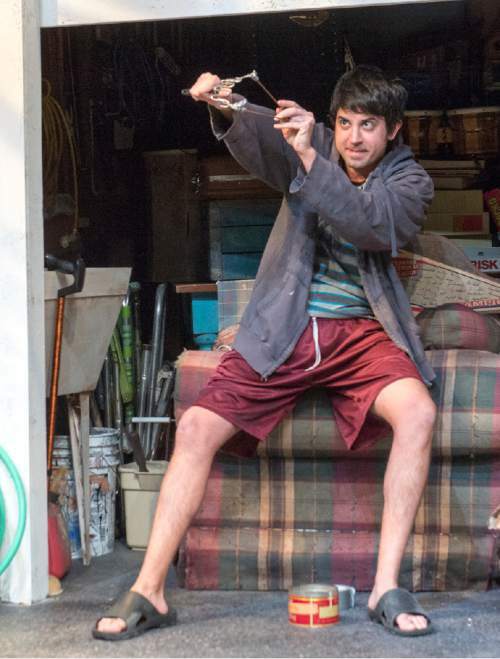 All of the subtle hints Fisher has cleverly constructed into seemingly random conversations throughout the play snap into sharp focus, and we see exactly who Benji is in all his conflicted complexity and why he behaves the way he does. Although he received physical and emotional wounds that will never heal, "it was my best day," Benji tells Sam, and we understand how that can be true. 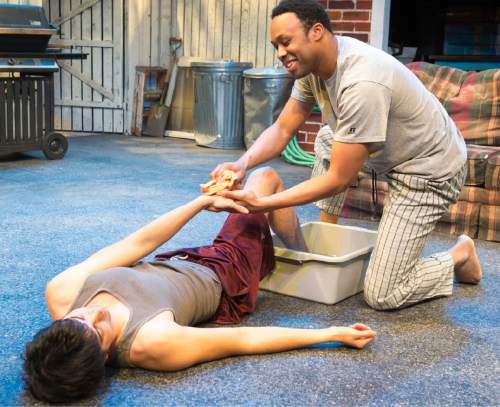 Balancing the play&apos;s profile of pain and self-destructiveness is its depiction of the sustaining strength of friendship. When Benji returns from combat, he goes to stay with Sam in the only place he ever felt at home, due largely to Sam&apos;s nurturing mother, the polar opposite of Benji&apos;s abusive father. 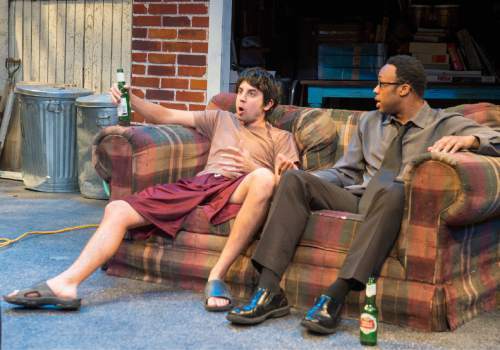 The two friends couldn&apos;t be more different: Sam is as organized and thorough as Benji is scattered and impulsive. Sam is an English teacher, fluent with words; Benji has trouble expressing his thoughts and emotions. 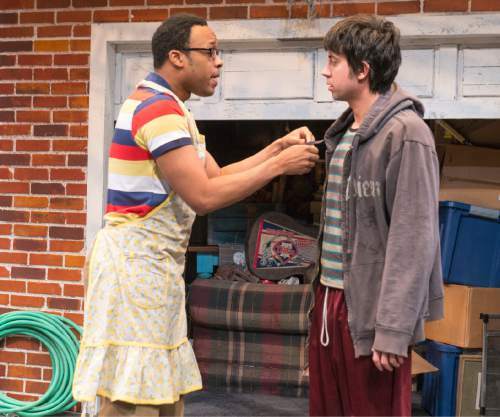 Most markedly, Sam is comfortable with his sexuality as a gay man; Benji feels compelled to prove his masculinity over and over like the neighborhood woodpecker of the play&apos;s title. 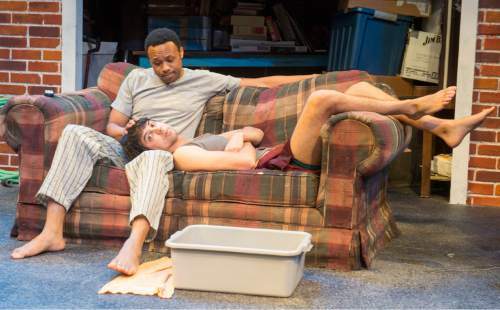 Sam admits he loves and hates Benji "more than anybody," but he inherited care and compassion from his mother along with his house, and brief appearances in the play by Benji&apos;s sister, Elizabeth, vividly demonstrate that the two could never live together. The woodpecker is not just a symbol in the play; it becomes a character, both Benji&apos;s adversary and his alter ego. Its pecking reminds him of machine-gun fire, but more disturbing is that he recognizes a connection to its unrelenting need to assert itself and unhealthy attraction to things that can hurt it. Fisher&apos;s dialogue is so direct and natural that our knowledge of the characters simply evolves from what they say and do. 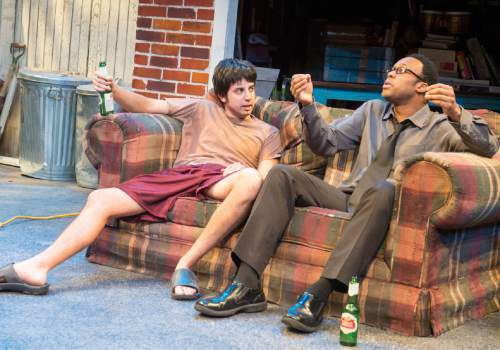 In the play&apos;s deeper, denser second act, we suddenly look back and see how far we&apos;ve come. 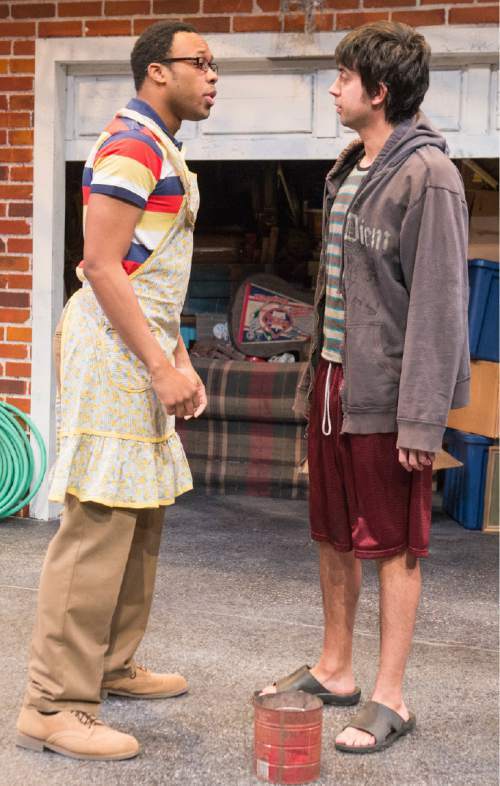 A major part of this recognition relies on the perceptive performances of Stefan Espinosa as Benji and Carleton Bluford as Sam. Espinosa&apos;s Benji is a seething volcano of clashing emotions that erupts at any time; as he limps around the stage, he has an amazing ability to appear cocky and helpless almost simultaneously. 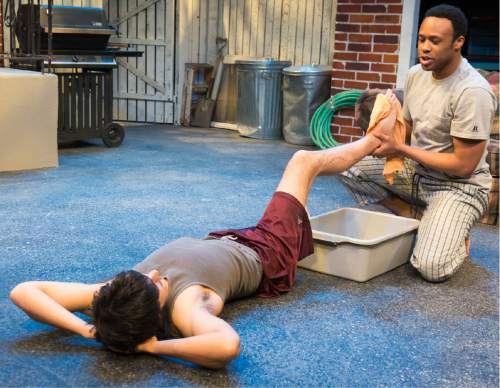 Bluford is the yin to his yang, almost instinctively chastising or comforting, patiently explaining or lashing out in frustration as he adjusts to Benji&apos;s emotional swings. Olivia Custodio is alternately chatty and judgmental as the oblivious Elizabeth, and Matthew Sincell is amiable and determined to defuse Benji&apos;s abrasiveness as Sam&apos;s unsuspecting date. 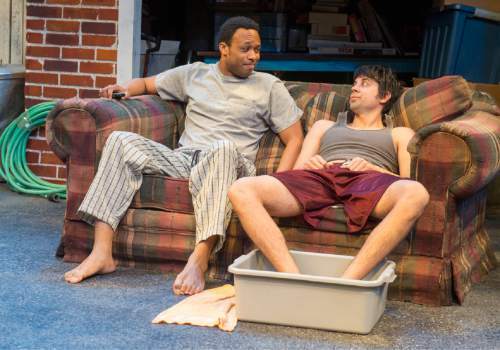 Director Richie Call&apos;s familiarity with the play is apparent in the way he unerringly hooks into its rhythms, channeling Benji&apos;s nervous energy into constant motion and sharply contrasting low-key and tense moments. 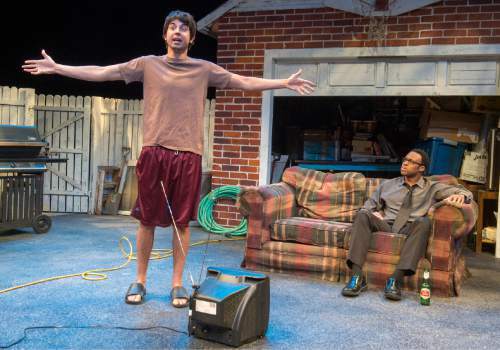 Dennis Hassan&apos;s richly detailed set, with its concrete driveway masquerading as an outdoor patio and garage stuffed with discarded furniture, tells us everything we need to know about this urban, blue-collar neighborhood before the play even begins. Nancy Hills&apos; relaxed, unsophisticated costumes and Jesse Portillo&apos;s straightforward lighting reinforce that image. 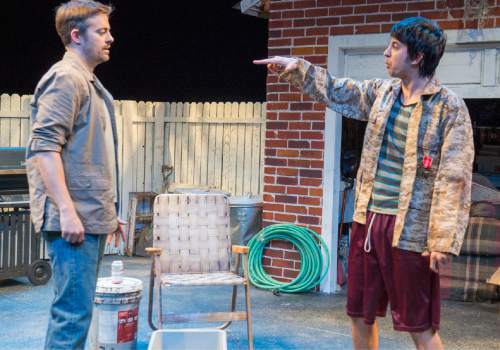 Salt Lake Acting Company&apos;s staging of "Streetlight Woodpecker" is one of the best new plays and most eloquent productions I&apos;ve seen in years. 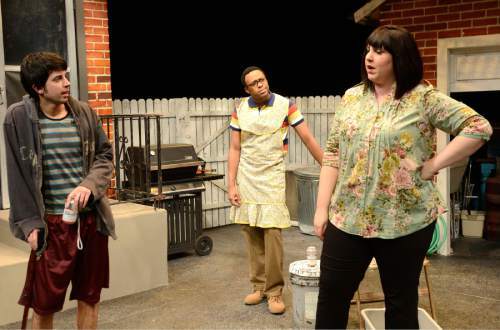 When • Reviewed on Feb. 12; plays Wednesdays through Saturdays at 7:30 p.m., and Sundays at 1 and 6 p.m., through March 6. Additional performances Tuesday and March 1 at 7:30 p.m. and Saturdays, Feb. 27 and March 5, at 2 p.m.